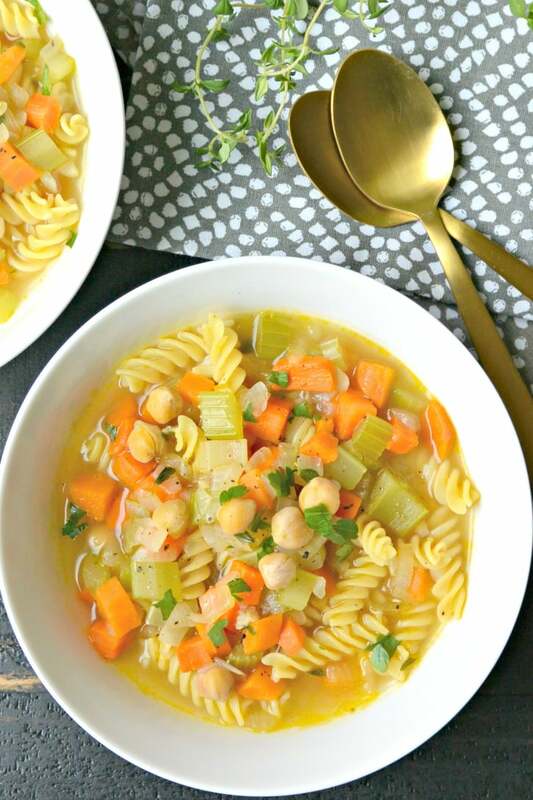 Chickpea Noodle Soup from Homestyle Vegan by Amber St. Peter is comforting, nourishing, and sure to make you feel better, no matter what ails you. It’s vegan and can easily be made gluten free. As a kid growing up, there was nothing like a hot bowl of chicken noodle soup to make me feel better when I was under the weather. Of course, my mom usually heated up a can of Campbell’s condensed soup with that distinctive salty yellow broth. I had a choice of noodle shapes since she always kept the pantry well stocked. 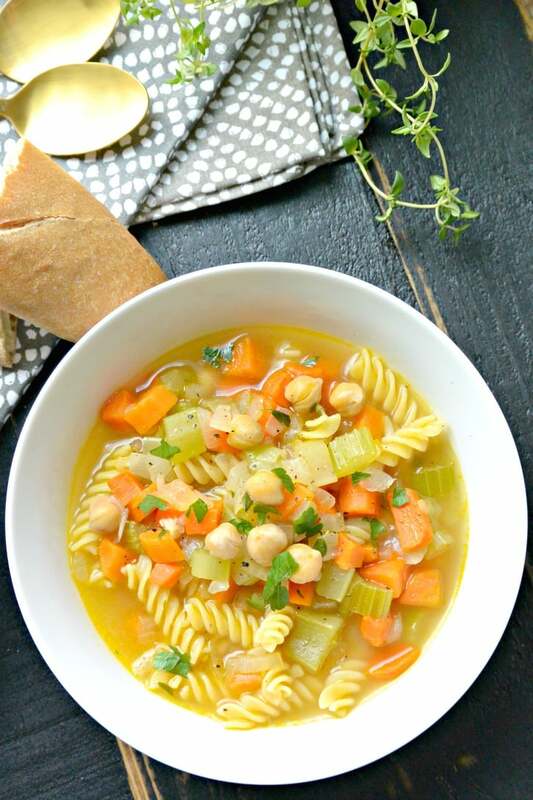 So when I learned I could pick a recipe from the cookbook Homestyle Vegan to share with you, I was immediately drawn to the Chickpea Noodle Soup. I’ve been excited about the book ever since I heard Amber was working on it. You may be familiar with Amber’s work from her website Good Saint (formerly Fettle Vegan). She creates delicious plant-based recipes, many of which are gluten-free. And now when I eat her healthy Chickpea Noodle Soup, it feels almost like a hug from my mom. 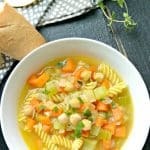 Before we get to the Chickpea Noodle Soup recipe, I want to share with you a little more about Homestyle Vegan. While other vegan cookbooks often rely on faux meats and tofu, this cookbook leaves them out completely. There’s no weird or exotic ingredients here. You can easily find all the ingredients at your local market. In addition, the recipes are very personal to Amber, based on what she grew up eating in Maine. So you’ll find remakes of classic dishes such as French Onion Soup, Green Bean Casserole with Crunchy Onions, and Perfect Peanut Butter Cookies. Besides the soup, I’ve also tried the Sloppy Chicks, which is a healthier (and delicious) version of Sloppy Joes. 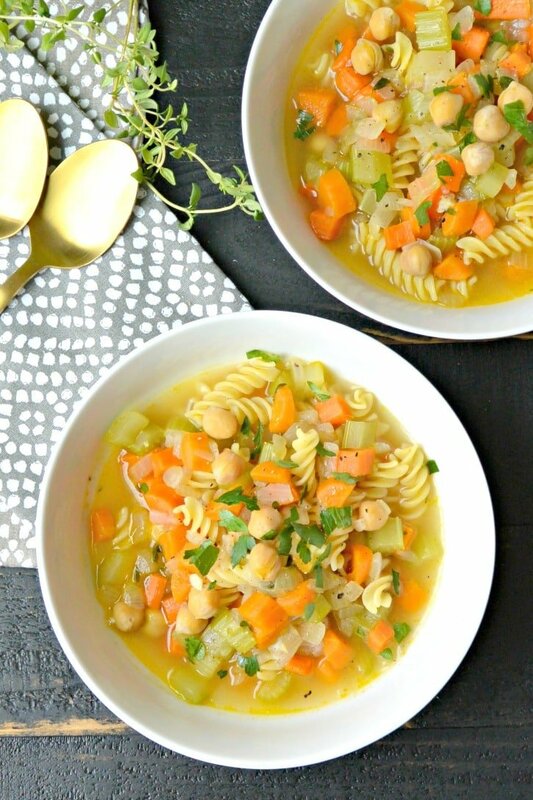 And I really think you’re going to love this Chickpea Noodle Soup! It’s easy to make with basic ingredients. In fact, you may already have most of the ingredients in your kitchen, like onion, carrots, and chickpeas (garbanzo beans). Plus you can make it in well under an hour, which is a requirement for me when I’m feeling under the weather. It would also be perfect for freezing in individual portions so that you always have some when you need it. And if you’re worried about mushy noodles, you could leave out the noodles when you freeze the soup. Then quickly cook some pasta in your favorite shape and add it to the soup after you reheat it. I love it whenever I’m in need of some comfort food. Plus it’s perfect when I have a cold or allergies. Instead of the whole-wheat rotini, I use gluten-free noodles. Besides Chickpea Noodle Soup, there are lots of easy recipes for vegan soups. 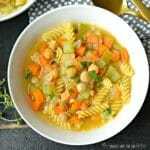 When I want other classic soups from my childhood, I like to make Vegan Minestrone Soup or Vegetable Bean Soup. And soup is so easy to make if you have an Instant Pot or other electric pressure cooker. Some of my favorites are Vegan Wild Rice Soup, Vegan Potato Corn Chowder, and Instant Pot Lentil Soup. Or if I’m in the mood for something spicy, especially when I’m congested or my sinuses are acting up, I turn to Spicy Coconut Soup or Vegan Taco Soup. What are your favorite soups? Let me know if you want me to create a vegan version of them! 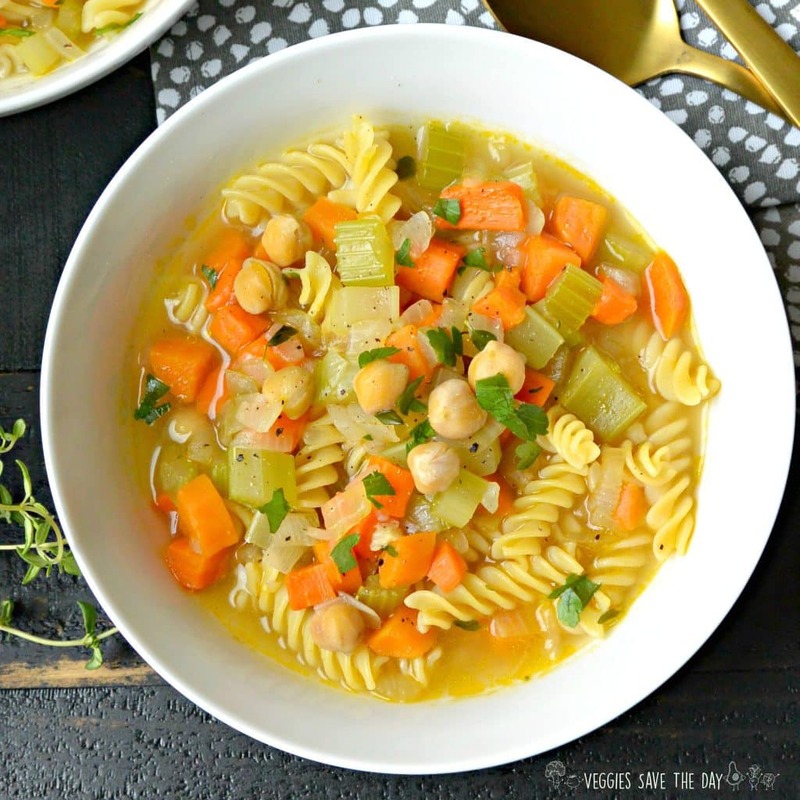 Now let’s make Chickpea Noodle Soup from Homestyle Vegan! In a cast-iron Dutch oven or large soup pot, heat the olive oil over medium heat. Add the garlic, onions, carrots, celery, fresh thyme and bay leaf and sauté until the veggies are softened, but not browned. Once the soup is boiling, add the noodles and chickpeas and cook for about 8 minutes, until the noodles are almost completely cooked (don’t worry, they’ll continue cooking in the water). Add salt and pepper to taste. Remove from the heat and serve with freshly chopped parsley and salty crackers or bread. Leftover soup can be refrigerated for up to 1 week or frozen indefinitely and reheated as needed. 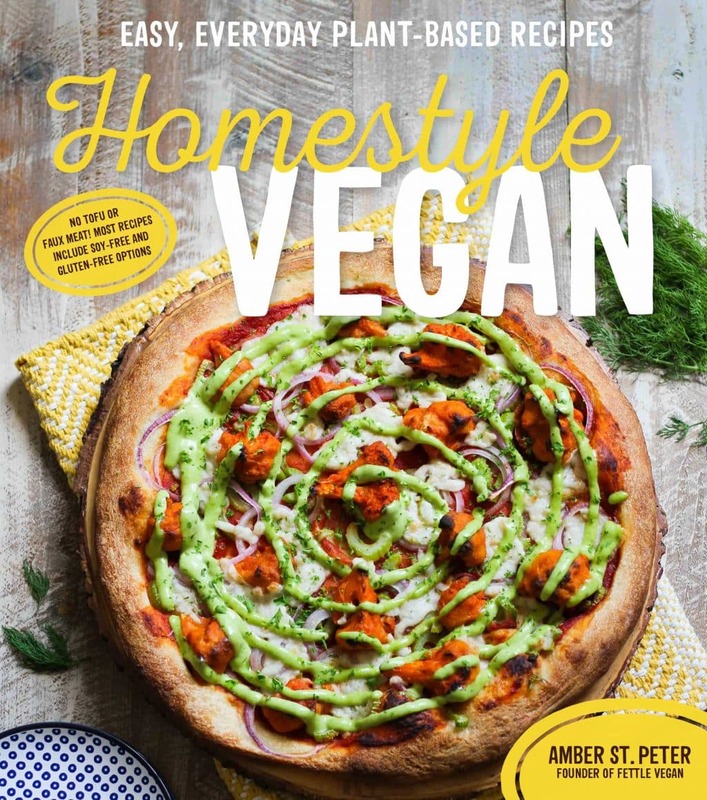 From Homestyle Vegan, copyright 2016 by Amber St. Peter. Used by permission Page Street Publishing Co. I have this cookbook but I haven’t made anything yet. Maybe I need to start with this soup! Great idea! It was a big hit in my house. I need to check this book out. It looks great! It is! The author is a friend of mine. She’s very talented. It looks so perfect! I could have used this last week when the whole family was sick. Ugh! It’s that time of year again. Definitely bookmarking this one! I was thinking of making a batch and freezing it to have on hand, just in case! Congratulations on such beautiful cookbook, Amber! I am so happy for you! Looks so delicious and that cookbook is on my list. I;m sure I’ll be reading through the pages real soon. Yes, I read cookbooks like novels and those titles are great. It’s wonderful! I enjoy Amber’s style. This looks so good! I’m adding this to my list of soups to make! It’s really good and so easy to make! It was a big hit in my house. This soup looks so hearty and good! PERFECT January remedy. Thanks Heather! It’s definitely been soup weather lately! Any suggestions as far as change of ingredient measurements or order of steps to make this soup in an Instant Pot?